Hurray! 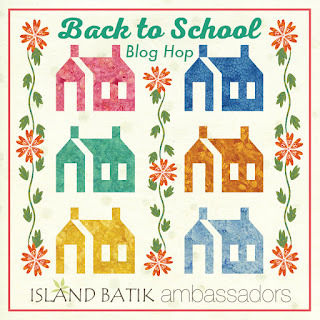 It's finally my day for the Island Batik Back to School Blog hop! I really do love this time of year, I think one of the main reasons is that it means that fall is just around the corner. Even here on the Oregon coast where the seasons aren't quite as dramatic as other places I look forward to the leaves turning color, the nights getting cooler and the fact that it's a great time for quilting (of course - because the kids are back to school!). The line I got to work with is Abalone. It's a beautiful beach themed line with loads of gorgeous color and fun prints. There are Stars, Sand Dollars and even Lobster prints. I really had fun playing with this set of prints, and was super happy that I had enough of the lovely pink-orange print (Carnation) for the background. Setting the other prints against it made me think of a lovely fall sunset at the beach, so I call this quilt Sunset Glow. Aren't the colors amazing? Here are all the fabrics laid out before I washed them - so yummy! My quilt features two different blocks in an alternating setting. One block features the Butterfly Unit from last month's Quilter's Recipe Box. 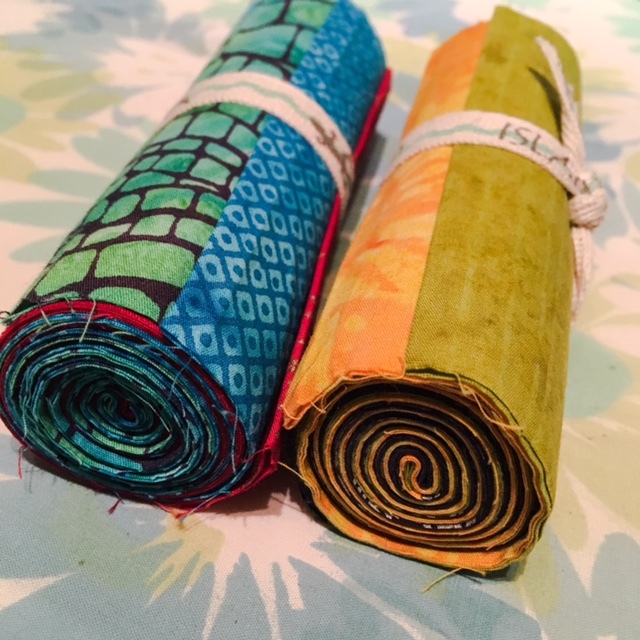 This was my original plan, but I ended up switching the blue swirl fabric for another fabric from Island Batik's Basic collection - Pool. For the second block I used a big triangle to show off the anchor print. I also changed this block, moving the purple print to the inside of the block instead of the outside. I finished the top back in July because I knew that August was going to be a little bit busy, but I had no idea how crazy it was going to end up! Luckily, that still left me with time to get it quilted, even with the extended trip we ended up taking at the beginning of September. I was able to get a wonderful match to the Carnation fabric from Aurifil (2420 in 50 wt), so had fun doing some over the top quilting on the background. I used 1248 for the dark colors, then for the border 5009 was the perfect shade! I used some ideas from Angela Walters Book "Shape by Shape Collection 2" Lots of really great ideas in this book! The inner border is another fabric from the basics collection: Bluebird. I am really delighted with how this quilt came out - it really is quite stunning, don't you thing? It even looks lovely against a gray and gloomy sky - we are thankful for some rain at last, but I did hope for some sun for a picture. 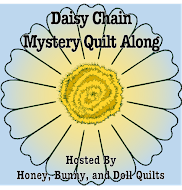 And what would a blog hop be without a giveaway? 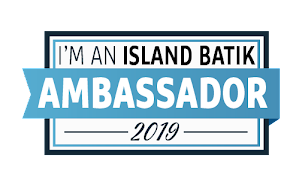 Island Batik is having a big giveaway, and if you love the Abalone collection as much as I do, you need to enter because they are giving away a bundle of this as well as two other collections! 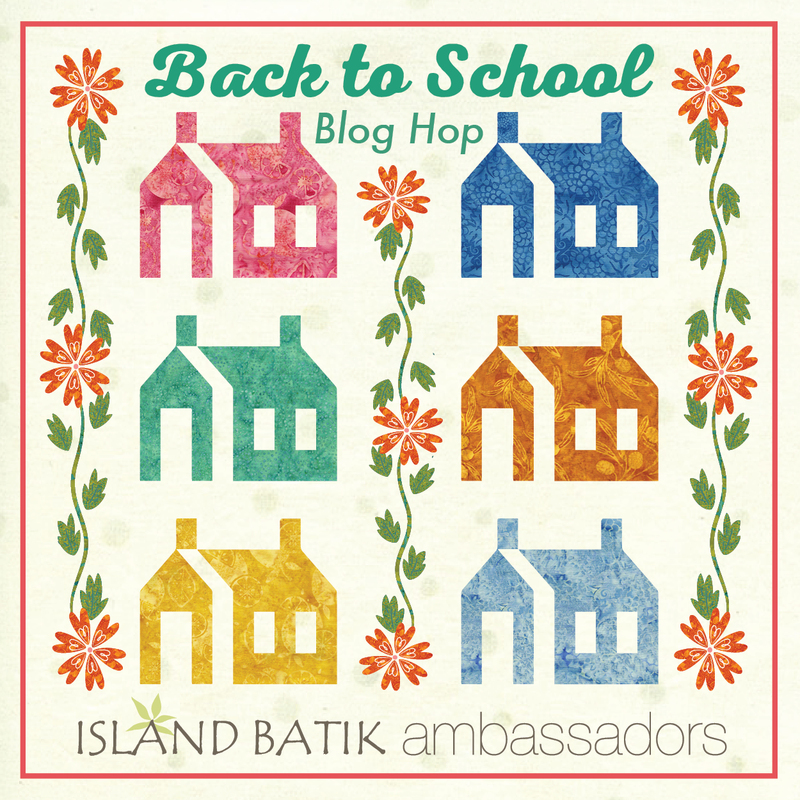 Here is the schedule for the rest of the hop - make sure you check out the other blog posts and collections - lots of giveaways and great projects, you will enjoy every stop! My favorite season of the year is fall. I love the cooler nights and everything seems to start slowing down. I love fall as well, for many of the reasons you mentioned. Also because it's football season! My favorite time of year is spring although autumn comes in a close second. The cool temperatures and beginning of greenery makes for pleasant times. I love fall because the heat starts to fade and you feel like getting something done!! I love decorating indoors and outdoors!! Great time of the year. I love your quilt Pamela. It is a very beautiful quilt made in these fabrics. Thank you for sharing and for the giveaway. My favorite Season is Spring. I love that everything is becoming new again. Spring is my favorite season all the colors and smells, plus the end of PA winter! Thanks for sharing and the giveaways! wow your projects are wonderfully bright and fun. what awesome fabric to work with. I think Spring is my favorite, although here in Florida there isn't a lot of difference between the seasons. 😊 I love your quilt! Thanks for sharing and for the giveaway. I love summer, Granddaughters get to come and stay for a week or two !! Your quilt is beautiful. Thanks for sharing. really cute quilt and fun tote! Fall! It is cooler, and time to gather and prepare for the holidays coming up. Love the quilt, love the tote. Love all the fabrics in this collection. My favorite season is Spring. We wait so long for it here in northern Wisconsin. Love it when all the shades of green start to pop. Stunning quilt in those beautiful fabrics! Your tote is the neatest and I love how you incorporated the Leah Day block into it! I must admit, Autumn is my favorite with all of the smells and colors exploding everywhere! Gorgeous! The colors are just wonderful, and how you played with them is inspiring. I would love to see a detail shot of the border quilting. Great job! I love all seasons, for different reasons, but I'm looking forward to cooler weather. I love that tote! and your quilt turned out gorgeous! Fall is my favorite time of the year--the leaves, cooler temps (and no bugs!) and all thingsn pumpkin! Such beautiful colors! I particularly love the pinks. Spring is my favorite with all the plants in the garden starting to peek through. Spring is my favorite season. I love seeing green again, & my spring flowers coming up. Spring is my favorite and it always seems like a long time coming here in Iowa! Winter seems to be half the year and once the snow melts, we not-so-patiently wait for the grass to turn green and the robins to return! Your quilt is beautiful, Pamela! Great quilt. I love Spring, new life everywhere. Awesome fabric and I love the blocks you created with them. I like Fall--wonderful colors and leaves, pumpkins and Halloween, a fun holiday! Your bag is so pretty--love those batiks. Spring is my favorite time of year because that's when nature comes alive once again. Also we can throw open the windows after being closed in all winter. Your quilt and bag are awesome. My favorite season is spring, I love seeing nature come back to life after a lot and cold winter. I love both Fall and Spring the most -pretty much a tie for me! Love the cooler weathers! Thank you! I love fall! Crunchy leaves and cooler weather! I love winter the best. There is nothing better than to be snowed in at home with a cozy fire going to keep warm with. Thanks! These batiks are beautiful! I can't wait to check them all out. Personally, I love autumn. I love getting cozy in my sewing room and getting work done while the world outside is cold and crisp. The colors make me feel bright and cheery! this is a beautiful quilt. The colors are great. My favorite season is fall. I like the cooler days and the changing colors of the trees. The colors that you used our great. I love spring! The green halos on the trees, flowers peeking through the snow, just the renewal of life in general. That being said...I'm nuts about the colors of fall! My favorite season is spring. So happy when winter is over. I have a hard time choosing my favorite season, mainly because I like the changes. Fall and Spring are fairly equal. Spring because we see all the new spring colors after white, white and black and Fall because of the richness of colors, harvest and the fun of being able to be outside and comfortable during the day. Love your work. Thanks. I love spring the most! Planting veggies and flowers and working in the garden is such fun.